Yesterday's protocol was used again today except that the samples were all incubated at room temperature for two hours and 8 samples of a 2.2 and 10.8 pH solution were created. For details on adjusting the pH of the supernatant solutions, please see Nicole's notebook. 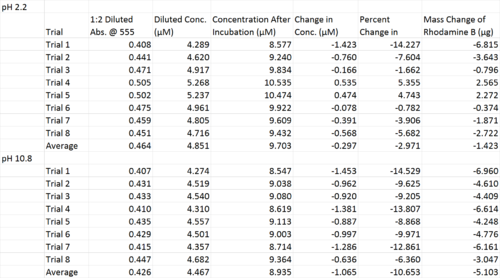 Below are the raw and calculated data for adjusted pH samples. The images above show the percent change in Rhodamine B concentration after incubation for 2 hours at different pHs. It is worth noting that the same erroneous analysis was used for these as yesterday. It was too late to redo these samples with a new calibration curve, however.